Hugo and Nebula award-winning author David Brin is one of the most eloquent, imaginative voices in science fiction. Now he returns with a new novel rich in texture, universal in theme, monumental in scope--pushing the genre to new heights. Young Maia is fast approaching a turning point in her life. As a half-caste var, she must leave the clan home of her privileged half-sisters and seek her fortune in the world. With her twin sister, Leie, she searches the docks of Port Sanger for an apprenticeship aboard the vessels that sail the trade routes of the Stratoin oceans. On her far-reaching, perilous journey of discovery, Maia will endure hardship and hunger, imprisonment and loneliness, bloody battles with pirates and separation from her twin. And along the way, she will meet a traveler who has come an unimaginable distance--and who threatens the delicate balance of the Stratoins' carefully maintained, perfect society. 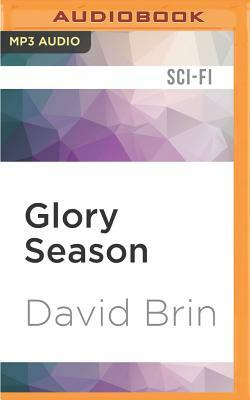 Both exciting and insightful, Glory Season is a major novel, a transcendent saga of the human spirit.